A large number of women use natural remedies to manage menopause and my experience as a prescribing Medical Herbalist has been wholly positive in using herbs to ease menopausal symptoms. 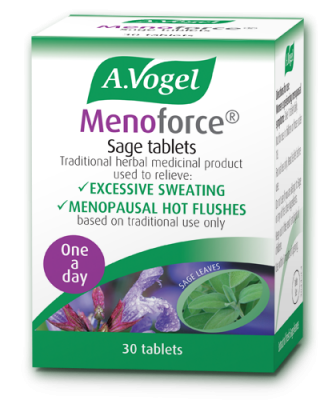 Often women choose in the initial stages of menopause to purchase an over-the-counter remedy such as sage or red clover to ease hot flushes. Sometimes these “simpler” remedies can be effective, however when a woman has a more complex array of symptoms or a more complex gynaecological history then a consultation is by far the best approach. During an appointment a Medical Herbalist is always keen to know about the different and varied symptoms that are happening. Menopause is so much more than hot flushes, but for most women their flushes are the worst symptom of all, especially if they are disrupting sleep. They can be dry, they can be wet, they can come with palpitations, they can come with a visibly flushed face, they can come on with stress, they can come on with a hot drink, they can come on at night, they can come on during the day, they can come on during that meeting and so on. It’s those subtle differences that are key to a Medical Herbalist getting the right combination of herbs for the individual woman. It’s not simply a matter of replacing “missing” hormones to ease symptoms, the aim of treatment is to facilitate a gradual natural fall in hormone levels, thereby easing the turbulence of change. Working in this holistic way means that the whole endocrine system is supported and that a herbal prescription will contain a synergistic blend of herbs to ease flushes, support the adrenal glands, support the nervous system and so on. Always being mindful of constitutional well being and lifestyle allows a versatile and individually tailored treatment plan. It also means that herbal medicines can safely be prescribed for women who have to avoid oestrogenic remedies or who are taking oestrogen blockers after having gone through breast cancer treatment. Likewise women who have had a history of endometriosis or fibroids might wish to approach menopause with less of an oestrogen replacement approach. There are a number of very effective herbs to ease flushes that don’t contain “hormonal” compounds, yet can bring about remarkable changes in symptoms. Other herbs act on hormonal receptor sites and contain the building blocks of oestrogen and progesterone. Yet more herbs are very good at calming nervous excitability and via nervous system pathways help to lessen the severity of symptoms. As well as using herbs to tone, nourish and support the body making positive lifestyle and dietary changes can also bring about significant improvements in well-being and can have a positive impact on menopausal symptoms. Simple measures such as eating at regular times can help to reduce flushes. During a consultation a Medical Herbalist will ask lots of questions about your health, well being and lifestyle. As well as a focused look at your hormonal history and a mapping of all your symptoms you can expect a top to toe health enquiry to get a picture of your whole body health. This coupled with a detailed nutritional appraisal and lifestyle overview gives your Medical Herbalist vital information to help plan a treatment strategy. You will of course be interested in your future health as well as your current health issues and looking at preventative measures to ensure good heart health and robust bone health will all be covered during the course of treatment with a Medical Herbalist. Treatment duration will of course vary from woman to woman and at the outset of treatment your Medical Herbalist will not be able to tell you how long you will need to take herbs. However you can expect to get results reasonably quickly with herbal medicine and feel a noticeable difference within a few weeks of treatment, if not days. Keren is a Consultant Medical Herbalist and owner of Health Food and More in Kirkcaldy. The Consultant Medical Herbalists working within Health Food and More are all experienced Members of the National Institute of Medical Herbalists.